Car-share organizations and companies can submit an application to Transportation Services for car-share parking permits for their vehicles. An Application for Car-Share Vehicle Parking Permit must be submitted for each requested on-street car-share vehicle parking areas (CVPA). Application includes a drawing created using free sketching application at http://www.accidentsketch.com/ that clearly shows the location where the installation of a CVPA is proposed. The drawing must provide all applicable measurements that will tie the location into the nearest intersection and the size of the CVPA. (Sample). Application includes a digital photo mocked up showing a green line outlining the proposed CVPA location (Sample). Should competing car-share companies apply for the same general location, at about the same time, Transportation Services staff will review both applications and determine in consultation with the companies if it is feasible to meet a compromise that satisfies both applicants. Each requested CVPA location must satisfy the following criteria in order to ensure that the CVPA does not adversely impact on safe and efficient traffic operations. Every location must allow car-share vehicle to park at all times of the day and all days of the week. 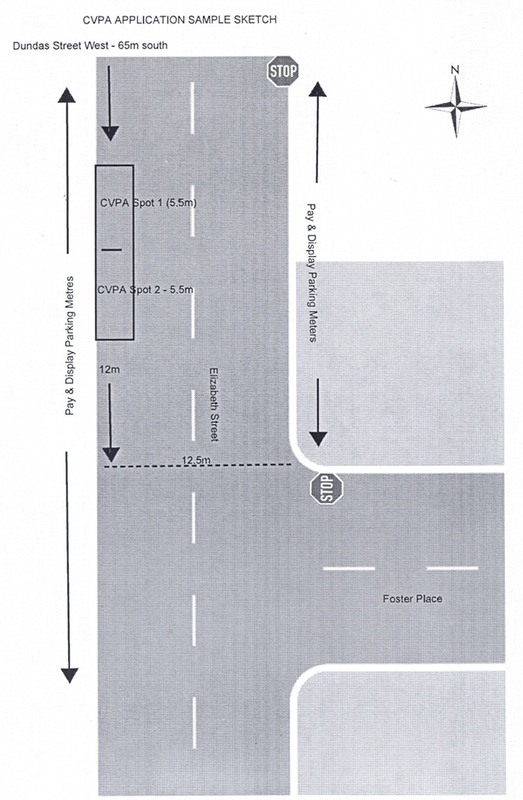 Proposed CVPA location must not be located closer than 30.5 m to an intersection controlled by traffic control signals or 9 m of an uncontrolled intersection or intersection controlled by “Stop” or “Yield” signs. The CVPA should be located close to one or more TTC routes. Each proposed CVPA location must be acceptable to the Ward Councillor. The CVPA will not be located in a low-density residential zone (i.e. in front of a single family home). The residential permit parking area must not be wait-listed for on-street parking permits. It is recommended that a representative from the car-share company contact Permit Parking during the application preparation stage, if the street is licensed for permit parking, to ensure the area is not wait-listed for residential parking permits. The CVPA program has implemented a three-tier permit structure. A fee is charged for each space within the area and one window decal permit will be issued per space. The permit must be affixed to the lower left-hand corner of the windshield of the car-share vehicle. A Tier 1 permit is the base permit fee for one space within a car-share vehicle parking area. This permit is issued where the designated CVPA will not impact on, or cause a reduction in, the number of residential permit parking spaces or Pay-and-Display parking spaces on a street. A Tier 2 permit is issued for each space within a designated CVPA that will eliminate or cause a reduction in the number of parking spaces in a designated residential permit parking area. A Tier 3 permit is issued for each space within a designated CVPA that will eliminate an existing parking space in an area where parking is controlled by a parking machine/metre. Should a car-share company/organization choose to allow multiple vehicles to make use of their CVPAs, a supplementary permit for each vehicle can be purchased. All permits are non-refundable and non-transferrable. A lost or stolen permit or a change in licence plate will be reissued for a replacement fee. The car-share organization/company is responsible for the actual cost of changes required to designate the area as a CVPA. The estimated cost for fabrication and installation of the sign and pavement markings is $362.60 plus HST. The annual fee for each tier of permit applies to the fiscal year (December 1st to November 30th) and is pro-rated monthly. 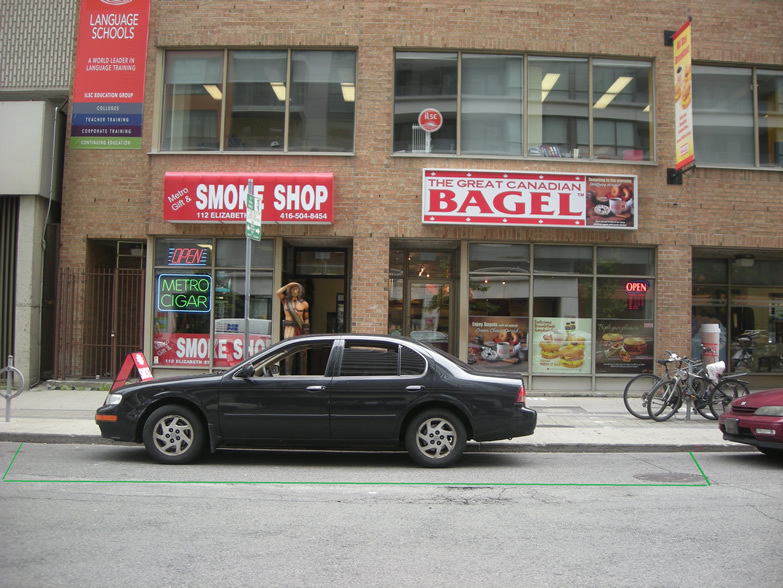 On September 14, 2009, Toronto City Council directed Transportation Services to initiate a pilot program to delineate on-street car-share vehicle parking areas (CVPAs). Since July 2010, a total of 20 on-street parking spaces, comprising of 6 locations in the downtown area, have been fully operational for the exclusive use of vehicles owned by car-share companies. CVPAs are highly visible parking areas on the city’s right-of-way that have pavement markings delineating the size of the parking space(s) and are signed for a specific car-share company to use. In 2012, Toronto City Council authorized the expansion of the car-share vehicle parking area program to a maximum of 40 spaces per year (10-20 CVPA locations, subject to the number of spaces at each area). Car-share Organization/Companies can submit applications to Transportation Services for the creation of additional CVPAs.